María Thelma graduated as an actress from the Iceland Academy of Arts in 2016, Just out of school she played Iris in the very well received TV series Prisoners (Fangar) Early 2017, she stared in the short film Miss Iceland that will premiere at the Reykjavík Film Festival (RIFF). María Thelma movie debut is Artic where she had the privilege to star opposite Mads Mikkelsen. 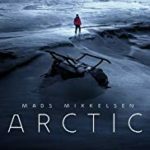 Arctic screen at Cannes Film Festival as part of the 'Official Selection' lineup. Maria Thelma currently under contract at the National Theatre of Iceland.